Full Peruvian, loaded with crimp, density and fineness and proven to produce quality offspring. Check out his fiber stats - AFD 15.2, with 9 crimps per inch!! In his first show at just 6 months old he placed 3rd and judge Kristen Buhrman said his fleece rivaled those of the first and 2nd place animals and was "remarkable". After winning first place at the Kentucky Classic, Judge Julio Sumar described him as a "beautiful package - fully dense, nice crimp, very fine and very uniform." 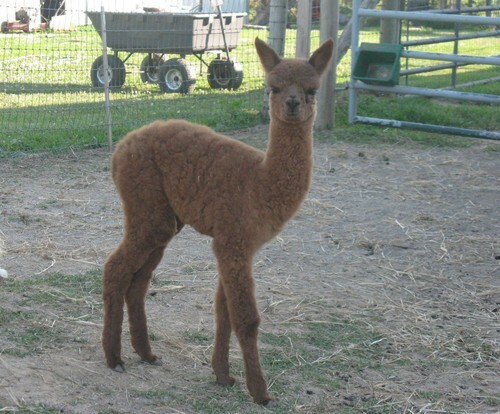 As a yearling his fleece was better than ever. 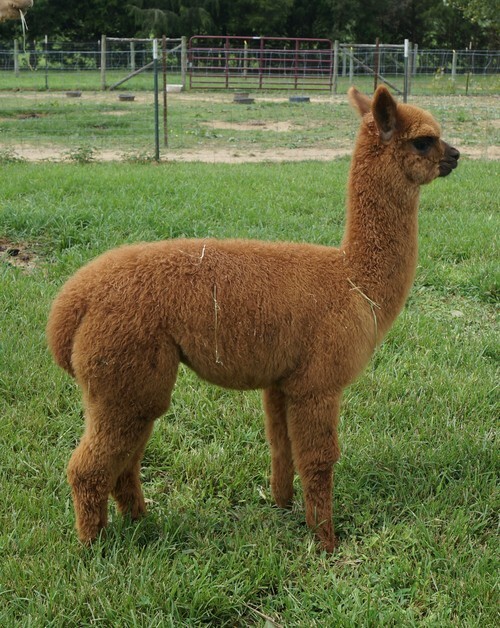 Combine his exquisite fleece with solid conformation and this is the animal to improve your herd! He consistently brings home the ribbons. He has maintained his fineness with an AFD of of 21.9, SD 3.9, CV 17.8 and spin fineness of 20.8 with his 2010 sample! 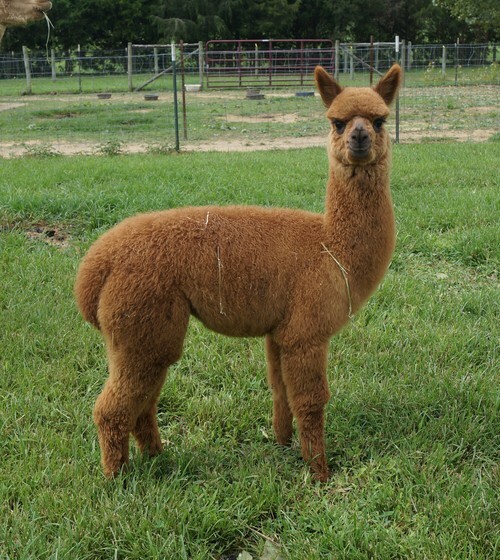 His sire, Victor's Hemiaccoyo Mirage was a blue ribbon winner in halter class at AOBA and his dam is a Peruvian import from the Alianza region. Esplendido has produced a wide array of colors, from white to black. Special: Esplendido's breedings are available for $1000 . Or, you can choose to pay $750 down and an additional $250 IF you choose to register the cria with ARI. We also offer additional discounts for drive by breedings and multiple breedings. 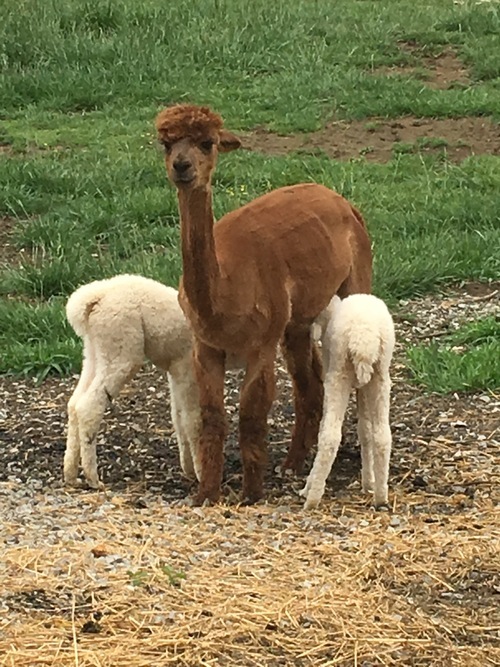 Margaret gave birth to a little girl cria on April 19, 2017. 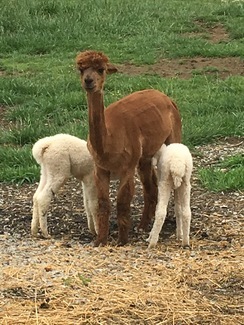 She is also allowing an orphaned cria to nurse, so she is working hard to nurture not one, but two babies! Proud of her!